As amazing as critical fame and fortune is, sometimes it’s just nice to be recognized as that fresh-faced Rite Aid assistant from the banners. Get yer flu shots folks!! Just as the year began, so again it ended. Two nights, 22 actors, and the motto was “Get in, have a drink, watch some acting, get out.” Short and simple, just the way I like it. Now that’s what I call a giant leap, for all mankind! Performed at Dixon Place in the premiere of Space Race, a new comedy by Nicholas Gentile. Think Star Trek meets Laugh-Off with a little extra surf rock thrown in. What a jam. A Million Hits is the title of a feature film directed by my incredible sister Janet Harvey, and it was just released on Steam for rental and purchase! Catch my cameo in the closing credits and check out the film’s IMDB page by clicking the banner on the right! Ask for Jane, a feature film created by Cait Cortelyou and directed by Rachel Carey, has been making the festival circuit! After premiering at the Hamptons and Woodstock Film Festivals in New York State, Jane will screen at the Napa Valley Film Festival in November! 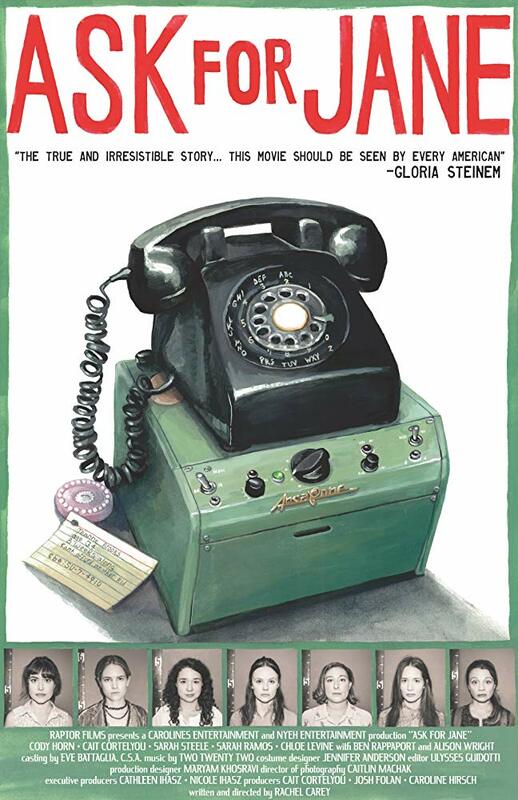 Click the poster to the right for the film’s IMDB page! Booked my first print job! a flu season campaign for a national pharmacy company! Keep a look out for me in stores and online! and we did the thing again! Played Puck again! This time INSIDE at The Actors Fund in downtown Brooklyn. Taking Midsummer inside was an extraordinarily rewarding challenge. I describe like moving from a master shot to a close-up. Once you take away the energy and volume required to perform outside, the need to contend with ice cream trucks and helicopters, and the ever-present danger of rain, you're left with groups of people in a forest trying to solve a problem (How do I get him to love me? How do we put on a killer stage show show? How do I fix a horrible mistake?). The sudden vulnerability of a quiet, enclosed theater made for a present, intimate, and moving performance experience. Good fun, that was. Having the time of my life playing Puck in an outdoor staging of A Midsummer Night's Dream with Smith Street Stage. Glad to say I probably sweated off a few pounds sprinting around in the Brooklyn heat. A few audience members had some very nice things to say about the show, and we were thrilled to be included on a number of critic's pick lists for summer Shakespeare. In July I'll be doing an additional week as Puck as Midsummer transfers theaters to The Actors Fund in downtown Brooklyn. Tickets on sale from Smith Street Stage's website. how now spirit? wither wander you? 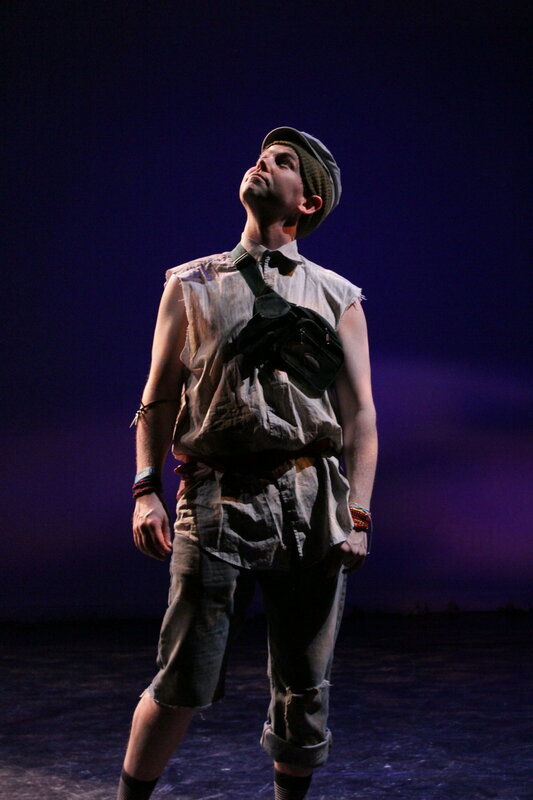 Playing Puck in A Midsummer Night's Dream with Smith Street Stage. 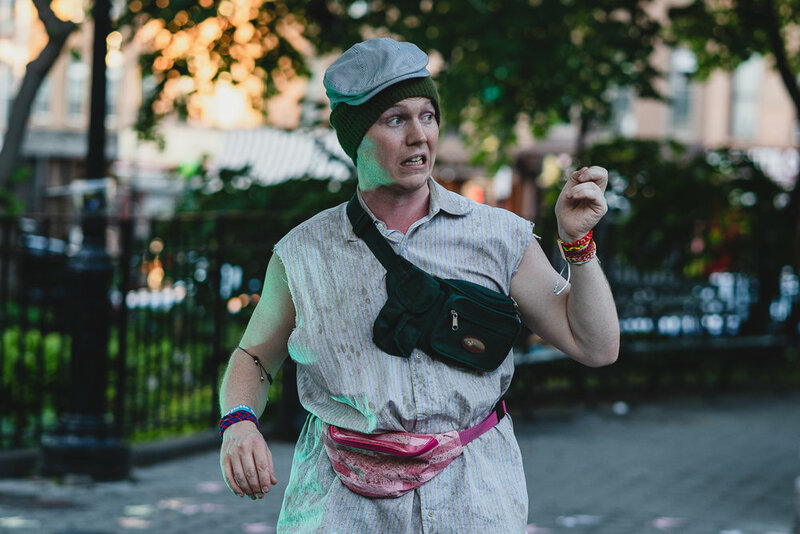 This is Smith Street's ninth summer doing Free Shakespeare in Carroll Park, this year with an added week of performances at the Mark O'Donnell Theater at The Actors Fund in downtown Brooklyn. Performances in Carroll Park run June 20 - July 1. All performances are free, and seating is first come, first served. Performances at The Actors Fund run July 11 - 15. All performances require a ticket, and seating is reserved. Details on tickets, casting, and more on Smith Street Stage's website. But here's a picture of me as the epitome of crumpled privilege in Old Names for Wildflowers. Can't be a part of the solution until you realize you're a part of the problem. Began rehearsals this month on a new play by Corbin Went, Old Names for Wildflowers, which will have its world premiere at The Tank in May. This is a piece I'm very excited to take to the next level, having performed in its inaugural reading a year ago. To be frank I'd had a hard time until shaking the eerie poetry of its dialogue, so the obvious solution seemed to be signing on to perform the thing 12 times. Or if you're interested in helping fund our production, visit our Classy Donation page. All funds raised help support an amazing piece of diverse and vibrant theatre. Seriously. Why would you not? After finishing Bill Coelius' Working Actor Solution this month (seriously, check him out here, one of the best teachers I've worked with), I took a week to travel to Killarney, Ireland, to act as travel photographer for my girlfriend, Amara, while she competed in Irish dance at the all-Ireland event. Apart from the obligatory Guinness and craic (a unique Irish word for fun and enjoyment) the greatest pleasure in getting to visit Ireland was in getting to slow down a jot and take time for the things that do the body good. Upon return to the United States, I've developed two new habits: taking time once a week to take a walk outside, and sitting down once a day to enjoy a cup of tea. It's true, you know, what they say? You see shades of green you didn't know existed. I began 2018 with a scene night with my classmates for industry guests. Many many thanks and gratitudes to the numerous friends and family who showed up to support myself and my friendly acting cohorts. This was a really unforgettable evening. Pro-tip on producing a show: keep it under half an hour and give everyone free beer. In 2017 I stayed in class through more than half the year, working on characters and scenes from Our Town, The Pillowman, Boom, and Kill Floor. I also completed the 101 course at Upright Citizens Brigade, culminating in my first show at the UCB East Theatre in the East Village, and completed Bill Coelius' Commercial Acting curriculum. I'm really looking forward to starting 2018 on the right foot. But for right now, I'd like to get some sleep. Yeah, sometimes it got weird. I liked it. Sue me. I had the pleasure of workshopping the world premiere of a new play by Corbin Went in Bass Harbor, ME. We explored a sweeping new drama in the remote wilds of New England. We had campfires. It was awesome. But seriously, it was in a barn. Wi-fi at this place was like a miracle. I joined Smith Street Stage the night of their big win for Outstanding Revival for their 2016 production of The Tempest. The IT Awards commentator did a double take at the step and repeat when they passed the mic over and this specky ginger said he played Caliban. Among the other IT Award nominations for The Tempest were the cast for Outstanding Ensemble and Clara Strauch for Outstanding Original Composition.